The concept of integrated project delivery (IPD) has evolved as a result of the need for highly expert teams of people to collaborate to deliver extremely complex projects, to manage expectations about delivery speed, changes in governance standards and to take advantage of and manage expectations raised by rapid advances in technology. All this demands effective change management. This is the first Handbook to contextualise and thematically explore the concept with an emphasis on rigorous practical and theoretical validation. An introduction to IPD concepts. The foundational elements and characteristics of IPD. People, culture and collaboration as key ingredients to successful and effective IPD. Technology and process aspects of relational contracting forms such as IPD. New and relevant perspectives to IPD that have received scant attention to date. Aspects and emerging issues that are rarely consciously considered in traditional project delivery due to the commercial imperative that drives firms and client organisations. The Handbook offers both discussions of these key themes, but also in depth research into construction and other industry project procurement and delivery that spans decades. In addition, the handbook presents ‘best’ and ‘better’ practice, but also includes insights into cutting edge experimental developments in technology and practices where proof of concept is currently being developed into emerging practice. 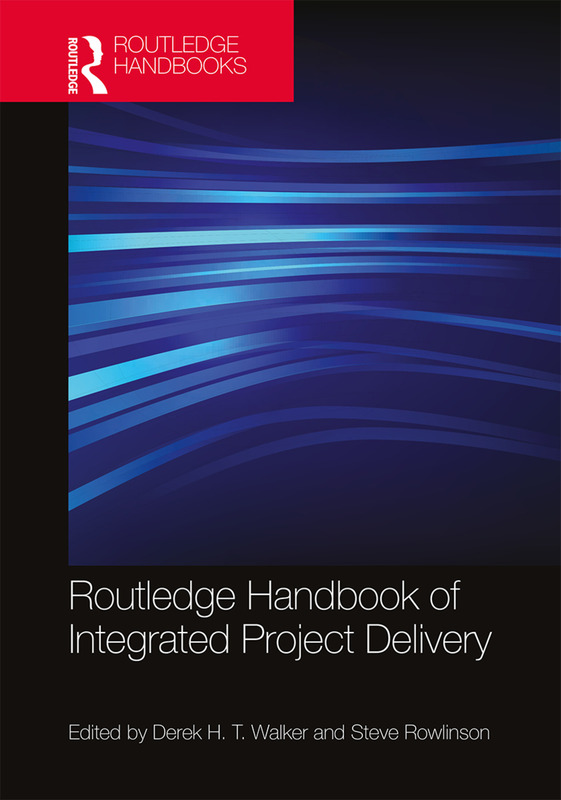 Contributing authors in this handbook collaborate with the co-editors to draw together an integrated set of chapters that align to deliver a coherent narrative of the IPD concept. An invaluable reference for practitioners and academics alike and useful as core course content for numerous degree programs of study and professional development courses. Where is IPD coming from and where is it going to? Newton, S., Lowe, R., Rowlinson, S. and Walker, D. H. T.
Derek H.T. Walker has been actively publishing from his research work in this area. His first book in this area, specifically in the project procurement and delivery field, had its focus on research results from an extensive longitudinal study of the Australian National Museum project which was a first for an Australian institutional building project alliance (Walker and Hampson, 2003). That book was followed by Procurement Systems - A Cross Industry Project Management Perspective (Walker and Rowlinson, 2008a). In 2015 he co-authored Collaborative Project Procurement Arrangements (Walker and Lloyd-Walker, 2015) that reported on a global study of alliancing and related similar project delivery forms. He also has collaborated with others writing many book chapters, journal and conference papers. In 2018 he received the 2018 International Project Management Association research excellence lifetime achievement in project management award. Steve Rowlinson has been coordinator of the CIB W092 working commission on Procurement Systems since its inception in 1990 and has co-organised numerous conferences and symposia in this capacity. He has also been co-author on a number of books in this field, for example the seminal text Procurement systems A Guide to Best Practice in Construction (Rowlinson and McDermott, 1999), Procurement Systems - A Cross Industry Project Management Perspective (Walker and Rowlinson, 2008a) and more recently New Forms of Procurement: PPP and relational contracting in the 21st century (Jefferies and Rowlinson, 2016). He has co-authored many book chapters, journal and conference papers.